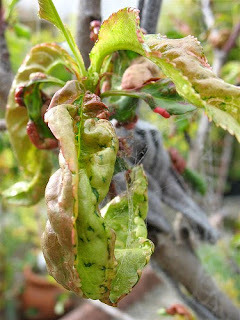 Peach leaf curl is a fungus disease called Taphrina deformans. It can cause defoliation and crop loss on nearly all varieties of peach and nectarine trees. This means that it is not just an aesthetic problem like thrips, it can harm, and even kill the tree. The most common characteristic is the curling and crinkling of the leaves as they unfold in spring. In addition to the curling, diseased leaves often pucker up thicker and can turn red or purple. Later in the season, powdery greyish white spores will form on the leaves, and it will spread even more. This disease also may occur on the fruit, blossoms, and young twigs. Diseased fruits will usually fall off of the tree prior to harvest. Luckily, peach leaf curl is one of the easiest fruit diseases to control. Leaf curl can normally be prevented with a pair of well-timed fungicide applications. I recommend applying the spray in the late fall after 90% of the leaves have fallen, AND in the spring just before bud swell. Remember, for effective disease control the fungicide must be applied at the proper time, and the tree must be thoroughly covered with the fungicide spray. When applying a fungicide, or any chemical for that matter, be sure to read the label and follow instructions to the letter. There are two main types of fungicide that are typically used to control peach leaf curl - "copper" based or "sulphur" based. They are both effective, but the sulphur based one loses it's potency as time goes on, so I would not keep it on your shelf for more than 2 seasons, and make sure that you use it quickly after you mix it. As with all garden chemicals, read the label carefully to properly dispose of any material you have leftover. Keep in mind that the fungus tends to overwinter on the tree's bark and it is a good idea to remove old leaves and debris from the ground below trees. Once the tree is infected, there is no cure, but simple management techniques will keep your tree productive AND attractive. Peter Rosen has over 20 years experience working in the landscaping industry. He is familiar with all aspects of garden care - from installation to troubleshooting, and even maintenance. He is well versed in the latest irrigation and lighting innovations. But most of all, he enjoys applying his knowledge and skills to each and every garden he is a part of.